« Private: Zaki Tamir, Eli Cohen, Will You Be Using The “Know Your Rights” Event As a Write off for CVB Grant? and was written by Mr. Blum. The holes in the ceiling of apartment 4D had been drilled the night before. Tonight’s work would be easy. But as Luis Ayala walked up the dimly lit stairwell of 2031 Seventh Avenue in Harlem, carrying a ladder and a black bag filled with rails and a can of kerosene, he stumbled in the darkness. The bag fell open onto the tiled floor, and the sound of the kerosene can rang through the empty hallway. In a moment, tenants were peering through apartment-door peepholes. The intruder’s ladder and the red kerosene can immediately announced to the residents what was planned for the building that night: It would be set afire. Though Luis Ayala was a small man, no one tried to stop him. Within half an hour flames were rushing through the holes he had bored in the top-floor apartment‘s ceiling and eating away at the roof. Those flames, just two years ago, began a chain of events that ended in the exposing of the largest arson-for-profit ring ever uncovered in the United States. Two arsonists who have admitted responsibility for 46 fires were indicted, along with 13 landlords who owned more than 400 New York buildings in an intricate maze of at least 45 corporations. Assistant District Attorney Kevin Hughes, a former fireman, outside burned buildings on Townsend Ave. He directed Bronx arson investigation. Nov. 10, 1978, was a success – the building burned through the night. But as he drove down Seventh Avenue, his wife at the wheel of their black Chevrolet, a man from the building followed the car shouting threats. And with the street illuminated by the blaze, the pursuer saw and memorized the license number – 793- JLP. Two days later the Ayalas fled with their 7-year-old son to Puerto Rico with airline tickets they received from the landlord who had paid for the fire. But even in San Juan, Luis Ayala could not escape the memory of the man who had chased his car. The arsonist, law enforcement officials later said, believed that the Police were hot on his trial. Brooklyn, it was not this lead – the sort of luck that often energizes the solution of a mystery – that put the arsonist in custody. Two fire marshals went to the Ayalas’ address the day after the Seventh Avenue fire and found that the name was not on any of the mailboxes. The fire marshals never went back and the case was classified as unsolved. It might have remained forgotten if Luis Ayala had not panicked. On Nov. 14 – two months earlier than he had promised the landlord who had bought his ticket – Luis Ayala returned to Brooklyn. His first stop was his apartment on Wadsworth Street. But although, to his relief, there were no police waiting, there was another surprise – the apartment had been stripped of all its furniture. Furious, he went to the landlord who had ordered the fire and who also owned the building where Luis Ayala lived. While he raged, the landlord calmly denied any knowledge of what had happened to his employee’s possessions. Then, as the arsonist grew wilder and more threatening, the landlord pulled out a revolver. Luis Ayala left, and walked straight to the 81st Precinct station. “I have some Information on some fires,” Officer Dominick Botte Jr. remembered Luis Ayala saying. For the next three hours Officer Botte and other members of the Brooklyn arson and explosion squad listened. At around 2 A.M. Sgt. 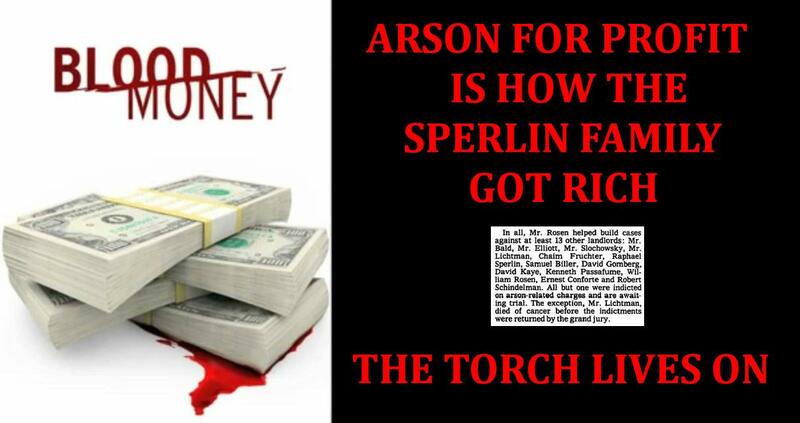 Robert Azzinari called Barry Kluger, the head of the Bronx District Attorney’s arson task force. A strategy was decided. Luis Ayala would become police confidential informant No. 378. The investigation that was to be code-named Operation Alps – an acronym for arson landlord profit scheme – had begun. Kevin Hughes rode with Ladder Company No. 1 for more than two years. “I saw a lot in those years,” he said recently. “I saw people hanging onto fire escapes in panic as the building around them burned out of control. I saw people walking down the street with no place to go, carrying all they had left in the world in a green garbage bag after their homes had burnt down. No longer a city firefighter, Kevin Hughes was now in a position to “get them.” At the worst of the city’s financial crisis in 1975, Kevin Hughes was laid off. He found work in the Bronx District Attorney’s office as an arson investigator during the day and went to law school at night. Now a 32-year-old assistant district attorney, he was the logical choice to direct Operation Alps. Arson — as the district attorneys and the police involved in the operation had been taught by frustrating daily experience — is one of the most difficult crimes to prosecute successfully. Statistics compiled by the Mayor’s Arson Strike Force reinforced their appraisal: within two hours of the start of an investigation, 50 to 60 percent of all cases involving suspicious fires in occupied buildings were simply dropped; in vacant buildings, 80 to 90 percent of such cases were closed within two hours. More disturbing, there was an arrest rate of only 5.9 per 100 cases of suspected arson during the first six months of 1980. A Kel SK-8 Intelligence Kit, consisting of an electronic transmitter and receiver, is used primarily by police in what they call undercover payoff situations. The six-inch transmitter, along with its 17 Inches of antenna wire — as thin as a strand of hair — is placed directly on the body of the informer. The microphone that picks up the conversation is then taped to the body of the person carrying the rig. Thus the first step In Operation Alps was to “wire” Luis Ayala. He would continue to solicit arson jobs from landlords, put now when he talked with someone, the conversation would be taped on a recorder by two detectives. It was chance that led Luis Ayala three years before the start of Operation Alps to become a professional arsonist. While working as a maintenance man for a Brooklyn landlord, he earned extra money by doing odd Jobs for a building superintendent known as Hector. The extra money was satisfactory, but Luis Ayala was puzzled by the work Hector assigned to him: drilling holes in the ceilings of vacant apartments. Curious, he followed Hector one evening to a building where earlier in the day he had bored the holes. Thirty minutes after Hector left the building it went up in flames. Luis Ayala confronted Hector with his discovery and demanded that he be taken into the ring. Hector, who was getting more work than he could handle, agreed. As he explained it, all they had to do was to wait for the “fire broker” to get in touch with them. The fire broker, a Brooklyn landlord, would provide them with the addresses of buildings and the keys to empty apartments. They would then have to make sure the buildings were destroyed. Luis Ayala would be paid apprentice wages, While Hector received a percentage of the insurance money collected by the building’s owner, Luis Ayala generally earned $100 and $400 to “torch” a building. Luis Ayala told the police that in the three years since he had met Hector he had been responsible for 20 fires in Brooklyn, the Bronx and Manhattan. In two of the buildings, both of them occupied, he returned to set another fire; the first had not made the property sufficiently uninhabitable. In one of the fires he set, three fireman were injured. Luis Ayala told the police he had never considered the moral or practical consequences of setting fire to a building filled with families. He saw arson as simply another way of making some money to support his wife, Myrna, and his son, Noel. But as a wired Luis Ayala began to move among the landlords who in the past had offered him work, the police soon realized they had a problem – no one was eager to talk to him. It seemed that the story of the arsonist’s confrontation with the landlord over the stolen furniture had spread. Now Luis Ayala was greeted with fear when he approached these people and was abandoned after a few tense and tentative remarks. The word on Luis Ayala was out: He was a man whose anger was so uncontrollable that it was sometimes necessary to pull a gun to end a conversation. Luis Ayala, Mr. Hughes was now forced to admit, would not propel him by leaps and bounds up the arson ladder. Instead, a new strategy was decided on. 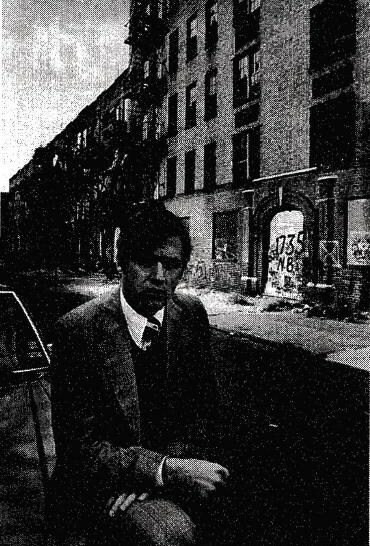 Luis Ayala would guide Operation Alps to another torch, a man who would bring the investigation directly within the ring of landlords who were burning down parts of New York. All told, more than 1,200 pages of police daily duty reports were written during Operation Alps. One, dated April 5, 1979, details a “visit to locations” accompanied by confidential informant “J. G. — the initials of Julio Garcia, the arsonist who had agreed to cooperate with the investigation after tapes had been played for him of incriminating conversations he had with Luis Ayala. The single-spaced list of 26 addresses fills nearly an entire page, each address now a ruined building. It took Julio Garcia, a 30-year-old plumber, nearly two years to burn the buildings on that list. For a while he was destroying at least one building every three weeks. The deal was simple: In return for Julio Garcia’s leading investigators to the fire broker who was commissioning fires, he would be given “fair consideration” in the prosecution of the fires he had set. On the afternoon of Sept. 5, 1979, Julio Garcia waited anxiously in a parking lot on Glenwood Road in Brooklyn for two landlords, Harry and Willie Rosen, who are not related. They had chosen the parking lot near their office for the meeting because, they believed, it was a safe place to talk. They were wrong. In the middle of the parking lot was a dark-colored van, and in a parting in the curtains covering its rear window was the lens of a Sony video camera. A detective of the Brooklyn District Attorney’s squad had the camera focused directly on Julio Garcia. Across from the van was another unmarked vehicle. In its front seat were Detective Botte and Sergeant Azzinari. Between them was what appeared to be a Samsonite attaché case. Eighteen minutes after Julio Garcia entered the parking lot, Willie Rosen arrived. What happened next was documented on Police Department videotape No. A431045 and tape cassette No. A431044: The landlords hired Julio Garcia to burn down two buildings. As the camera recorded the meeting, a few minutes of friendly conversation took place before Willie Rosen finally got down to business. He handed Mr. Garcia $30 and a key to apartment 7D at 1783 Union Street in Brooklyn. The apartment was vacant, and the arsonist simply had to drill holes in the ceiling, set the fire and watch the blaze spread to the roof. The $30 was to buy gasoline; it would pay for enough, Julio Garcia was told, to burn down the Union Street building and another at 1448-1452 Sterling Place in Brooklyn. Willie Rosen then left the parking lot, but he returned nine minutes later. This time he handed the arsonist $150 cash, a partial advance payment for the two fires. Not long after the money changed hands, Harry Rosen appeared in the parking lot. He talked briefly with Julio Garcia. But it was long enough for the microphone taped to the arsonist’s chest to pick up Harry Rosen’s apparent involvement in the plan to burn down two buildings. Just a month after these tapes were recorded, on Oct. 4, 1979, Harry and Willie Rosen finally got to see them. They were on their way to their Glenwood Road office when a police car forced their car to the curb. The two landlords were placed in the back seats of separate police cars and driven across the city to the Bronx District Attorney’s office. They sat in Mr. Kluger’s office with Michael Hammerman of the Brooklyn District Attorney’s office, and Mr. Kluger ordered that the tape be played back. The meeting in the parking lot came clearly into focus. The taped conversation filled the quiet room. Just as the picture on the screen showed Willie Rosen handing the key to apartment 7D to Julio Garcia, Harry Rosen yelled, “Shut it off!” The tape continued to roll. “Shut it off!” he said again. This time his tone was resigned. The machine was stopped. On Jan. 18, Harry Rosen moved uneasily through the lobby of a downtown Brooklyn office building. Concealed beneath his shirt was a tiny recording device. He felt awkward in the role of a secret agent, and he was afraid something would go wrong in his meeting with Joseph Bald. It had been more than 20 years since the men had met, when Mr. Bald was in the drapery business and Mr. Rosen was a grocer. Now Mr. Rosen planned to trap his friend into a discussion of fires they had set in rundown buildings they owned. Detectives hiding downstairs opposite the office at 16 Court Street would be listening closely to every word. Joseph Bald was already familiar with the techniques that could be used by law enforcement authorities — such techniques had already resulted in his conviction for attempted bribery aimed at balking prosecution of a stock scheme involving reputed organized-crime figures. He knew that the police believed he had organized-crime connections, and that the Fire Marshal’s office had been trying to make an arson case against. So when Harry Rosen arrived, passing through a tiny vestibule into the shabby inner office, Joseph Bald told him he was afraid his office might be bugged. They went into the men’s room. In their conversation there, according to police reports, the two men agreed that, together with a 35-year-old lawyer named Bruce Elliott, they would divide equally an insurance payment for a building they owned jointly at 201 Marcy Place in the East Bronx, and that they had agreed to burn. Harry Rosen had already told the authorities that, in a moment of confusion, he had sent two different arsonists — Julio Garcia and Luis Ayala, both of whom later became informers for the police — to that same building on Marcy Place, paying each one several hundred dollars. Within a matter of hours two separate fires broke out on the top floor of the building. Setting fires at the top, the arsonists explained, was the method they most often used. That way, they said, there was less risk of injury to tenants, and water damage would destroy the lower floors, insuring larger insurance payments. What happened at 201 Marcy Place demonstrated other problems that authorities say are typical of arson. For example, they say, it is often difficult to determine the owner of a building that has gone up in flames. The 828 Green Avenue Corporation was listed as the owner of the building on Marcy Place. But officials determined from the conversations they taped that Harry Rosen, Bruce Elliott, Joseph Bald and his partner, Abe Slochowsky, all had an interest in the property. 1nflating its value, they had taken out an insurance policy for $500,000 and sought a settlement of $130,000 after the two fires. The insurance underwriter, at Lloyd’s of London, was ready to pay them $72,000, but the landlords, seeking more, turned the offer down. They later regretted it. In June Mr. Bald was indicted on a charge of arson In Queens, and because he had been calling the insurance company to negotiate the claim, his name was quickly recognized. Lloyd’s dropped its offer to $16,000. Unlike the vast majority of arson cases, and unlike many other claims the same men had submitted, this one was never paid. Before the owners and insurance company could agree upon a price, all four partners were indicted. The charges included arson, conspiracy to commit arson, presenting a false insurance claim, reckless endangerment and attempted grand larceny. All have pleaded not guilty, except for Harry Rosen. The arson unit of the Bronx District Attorney’s office, on the fourth floor of the county’s Criminal Court Building, is just minutes from the sort of territory in which Julio Garcia was used to operating — with kerosene and matches and piles of rags. On almost any street one can see children playing in the blackened shells of once-substantial apartment buildings, unmindful of the rats or of the reasons for the neighborhood’s wholesale devastation. But Kevin Hughes gets angry. For him, an Informer like Harry Rosen is a “tool,” he says, a kind of necessary evil. As the months went by, Mr. Rosen taped Mr. Elliott and his other partners in private conversations. He also turned over to the police the checks he had received from Joseph Bald and Abe Slochowsky — money he said represented shares of insurance payments or fees for helping to set up fires. Lawyers for some of the indicted landlords said that Mr. Rosen had been the worst of them — a fire broker who had acted as an agent for the arsonists, selling their services to his friends and then collecting evidence against them. “It’s like dealing with Hitler to get some of his lieutenants,” said Edward M. Rappaport, one landlord’s lawyer, criticizing the investigators. While cooperating with the authorities, the landlord-turned-informer described in detail how he and the other men, in varying combinations, routinely profited from illicit dealings. He said, for instance, that he had conspired with Joseph Lichtman late in 1977 to burn a building that they owned at 1280 St. John’s Place in Brooklyn, paying Julio Garcia $500 or $600 to do the job. The following fall, Hany Rosen said, he received a check for $23,000 as settlement on the resulting claim, from an insurance policy placed with Lloyd’s London through Columbian Brokerage in the Bronx. 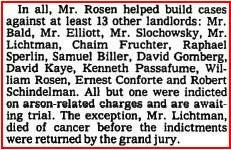 In all, Mr. Rosen helped build cases against at least 13 other landlords: Mr. Bald, Mr. Elliott, Mr. Slochowsky, Mr. Lichtman, Chaim Fruchter, Raphael Sperlin, Samuel Biller, David Gomberg, David Kaye, Kenneth Passafume, William Rosen, Ernest Conforte and Robert Schindelman. All but one were indicted on arson-related charges and are awaiting trial. The exception, Mr. Lichtman, died of cancer before the indictments were returned by the grand jury. Tomorrow: The patterns of suspicious fires. This entry was posted on February 2, 2011 at 8:59 pm and is filed under Chanina Sperlin Family, Exposed. You can follow any responses to this entry through the RSS 2.0 feed. You can leave a response, or trackback from your own site.